My friend send me a book with thoughts for happiness and some colouring in, to cheer me up whilst I am recovering from the operation. I came across a text yesterday that said one should treat life more like a game. It said that even though in a game we would like to win, loosing isn’t that tragic either. 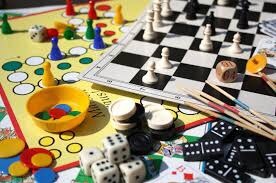 Games are fun and people get together and enjoy a board game and have a laugh. This is a German book. Board games are very popular in Germany, by the way. And when people cross our plans and set us back we can laugh about it. I don’t agree with that at all. When we lose in real life it can have massive consequences. Playing games in real life is associated, for me at least, with cheating, strategies, planning ahead so somebody else loses. Seeing life as a game can be quite dangerous, in my opinion. You lose sight of the fact that you are dealing with real people and real emotions. I often think about this as my job is in business and the other day I saw an email that read: Britta, don’t forget we are a business nt a charity! I can’t say too much but it was basically about sacking someone or giving them another chance. I have seen people planning and scheming to get right to the top of ‘their game’. All though they might be very successful, and hard working, some of them have lost all sense of humanity and come across as cold hearted. I can on the other hand see that the text maybe refers to not taking things quite so seriously. Sometimes we worry so much about the future that we forget the here and now. Because the here and now is the only part we can affect in life. Then maybe I slightly agree that we should stop worrying about the future and life in the here and now and have the best possible day we can, each day at a time. I think we should always take one day at a time, but also live life respecting that it is a gift. That comes with responsibility to others as well as ourselves. I have seen people willing to do anything to get to the to, but sadly… Many people are not happy at the top. It does not guarantee happiness. Being content with what you have brings more happiness but always also be willing to dream.